So remember that post about how excited I was to have my first backpack and was heading to REI to ask them to fit it to me? Turns out the clearance that, just so happens to be calling me to buy it and kick off my planning, Osprey Kestrel 68, doesn’t fit. Poo. The one time it works against me to be skinny and short. When I cinched it up the hip pads were touching each other giving it no room to get smaller (as I will inevitably loose more weight while on the JMT trip.) AND my torso measures at 16 and the Kestrel’s smallest set up is 18. So there I was starting over with the part I’d thought I’d got checked off my list. Fortunately a wonderful employee named Katie came to my rescue. She very quickly pulled a few packs down that fit the bill of a Women’s XSmall. I tried the Gregory Deva 70 and that was a quick no. After filling the pack with 25 pounds worth of sand bags (of varying weights) and putting it on, I was immediately greeted with a very unpleasant protruding “support” in my lumbar region. Ick. The other remaining options were the Deuter ACT Lite 60+10 SL and pretty much nothing else in the size I was looking for. After trying the Deuter and not loving it, Katie called her co-worker Jason for back up. He promptly suggested the Osprey Ariel to which Katie promptly contested that it didn’t come small enough. To prove it she brought out the list of all the backpacks that REI carries and it said the Ariel, at it’s smallest, was 18. Jason then saved the day by letting Katie and I know that that was simply a misprint. It did indeed come in a 16 and they happened to have one in stock for me to try. 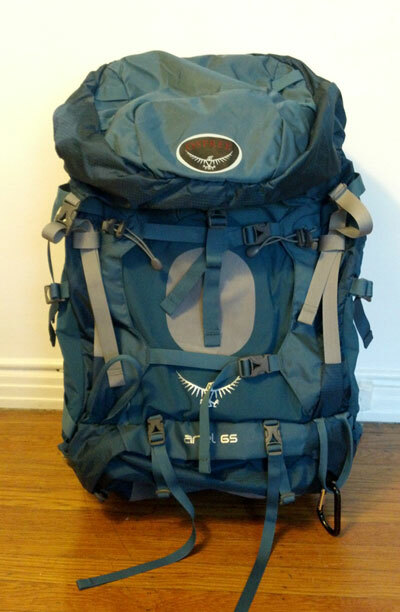 After going back and forth between the Deuter and the Osprey, I decided to go with… the Osprey. The Deuter felt like it was pulling backwards from my chest strap with the weight in it and I simply couldn’t give up all the great feel and features of the Osprey pack. Hopefully this pack will serve me well. I look forward to getting to know it better on several trips this year, including the Tahoe Rim Trail. Cheers!